In front of the importance the media are giving to the Aminatou Haidar issue, the representatives of the Sahrawi tribes living in Europe and regrouped within the Association of Sahrawi Tribes in Europe (ATSE) have strongly reacted and vigorously condemned the media and politician over-exploitation, in keeping with a large plan of manipulation and brainwashing, remote-controlled from Algiers, with the complicity of certain Spanish milieu, aiming at distorting the facts as they are on field and undermining the influence and sympathy which enjoys , on the international scene, the Moroccan autonomy project for the Sahara called Western Sahara. Thus, the Association of Sahrawi Tribes in Europe called the international community, through its institutions and non-governmental organizations, to act levelheadedly and vigilantly and to make the difference between crass rigging deeds, planned and controlled by third countries, fiercely opposing , for different reasons, the completion of the territory integrity of Morocco, and undeniable facts of destitution and abuse of thousands of persons, held prisoners against their will, in the Lahmada camps in Tindouf, in the Algerian territory, and who are suffering from malnutrition and from all possible and conceivable hardship, despite of the important humanitarian aid intended for the Tindouf camps and diverted by the Polisario militia, with the active complicity of the Algerian armed forces. This call is taken over by the civil association named “Organization of the Moroccan Sahara in Sweden” (OSMS) , it denounces, as far as it is concerned, the exploitation of children in this anti-Moroccan campaign of pressure and denigration and which has no other aim but confusing things by creating a false issue based on a minor fact completely made up by the called Aminatou Haidar and her recognized godfathers. Besides, the section of the Moroccan League for the Protection of childhood (LMPE) also denounces the media and politician manipulation of children in an issue which does not concern them. It expresses its anxiety about the fate of children exposed in this campaign of media hype and declares itself ready to defend and preserve the basic rights of children who are involved in this situation by calling for justice and on international organizations in charge of children. 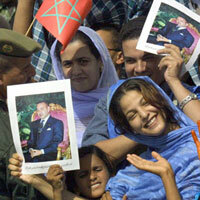 As far as the League supporting the human rights in the Sahara is concerned, the condemnation is unanimous. Besides, the league stigmatizes the dealings of certain Spanish milieu, journalists and Parliament members among whom Roza Diaz who try, since a long time, without restraint, to reflect a confused image of the human rights scene in Morocco and the positive evolution it is undergoing since a decade, in order to damage the positive and reassuring image of Morroco abroad.